Last February, after years of effort, Washington, D.C. managed to make it back to the ’60s, when it unveiled its new H street corridor streetcar District Department of Transportation line. From the start, it had been a project beleaguered by difficulties. The streetcar hit parked cars, ran laughably slowly, was expensive to construct, and ran down a street alongside a preexisting bus route. No matter. On Monday, the District Department of Transportation announced that it would not charge fares on the H street corridor streetcar for at least four years. In addition, it wants to extend the line to a transit station at the border of northeastern D.C. and Maryland. “It is much more appropriate to continue to improve the service quality of the starter line we have here on H Street and advance the project to Benning Road Metro so we have a comprehensive transit alternative, and at that time integrate a fare,” said Leif Dormsjo, director of the District Department of Transportation. Dormsjo’s remarks come after record-high ridership numbers for January 2017. The streetcar’s popularity was boosted by crowds who came to the city for the inauguration and Women’s March. Still, more than 80,000 total passengers rode the streetcar during December, a 16 percent increase since March, 2016. Dormsjo and others fear that charging a fare for the H street corridor streetcar will cause ridership numbers to drop dramatically. A similar system in Atlanta saw ridership fall by 48 percent during the first three months of the new fare. DDOT’s analysis predicts that a $1 fare would cut ridership by 30 percent. This would come on top of the $500,000 it would cost to install a fare system on the cars. Part of the trouble is Washington’s dysfunctional metro system. Whatever farecard system the streetcar adopts should be compatible with the one used for the metro trains. Washington’s metro just scrapped a test program for a next-generation, cloud-based payment program and continues to use outdated technology. “If we introduced a fare card system just to be stand-alone for the D.C. streetcar system, it would be obsolete the day we launched it. So we are trying to take the long view,” Dormsjo said. How long will that view be? It’s hard to say. For the foreseeable future, the H street corridor streetcar will remain free to ride. The DDOT has not provided details of how it might decide to begin fares. Nor is it the only streetcar system in this bind. Portland’s streetcar didn’t charge fares for the first 11 years of its existence. For riders to believe the streetcar worth paying to ride, it needs to offer some advantage that preexisting transit modes do not. So far, it is struggling to do so. At present, the streetcar runs down the already congested H street corridor. A planned expansion will add a spur to a transit station on the Maryland border by the end of the year. Even with the expansion, the streetcar offers little that a bus does not. Unlike a metro train, the streetcar drives on the street itself, meaning that congestion, roadwork, and car accidents can unexpectedly delay service. According to the streetcar’s twitter feed, police activity and traffic accidents shut down service on three separate days last week. Supporters argue that streetcars are about economic development as much as transit. Masters of spin, some of them even argue that streetcars’ slow speed is an advantage: It gives passengers more time to see their surroundings and additional opportunities to get off and shop. Although streetcars are archaic and expensive, supporters claim, they spark new development and increase property values alongside the new lines. Is it? Wiener and others point to Portland as an example of where streetcars led to billions of dollars in economic development. Randal O’Toole, a senior fellow at the Cato Institute, disagrees, pointing out that Portland gave developers nearly a billion dollars in subsidies to help reinvigorate the neighborhoods served by the streetcar. “Any redevelopment of D.C.’s H Street is happening in spite of the streetcar, not because of it,” O’Toole says. 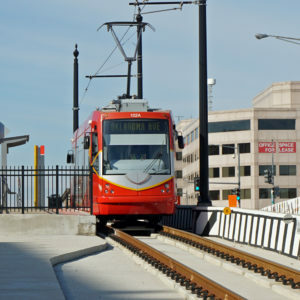 Meanwhile, the city of Washington shells out $8 million a year to operate the streetcar and plans to expand the line both towards Maryland and, hopefully, to connect downtown with Georgetown. So far, no studies have been done to show if these expansions would be any more efficient then the current line. O’Toole, at least, is skeptical.